The arrest of Jignesh Shah in the National Spot Exchange scam will make it even more difficult for investors to recover their money. Jignesh Shah often claimed the late Dhirubhai Ambani as his role model. But while Ambani founded what is now India's biggest private-sector company by revenue, Reliance Industries, Shah is now watching his business empire crumbling before his eyes. 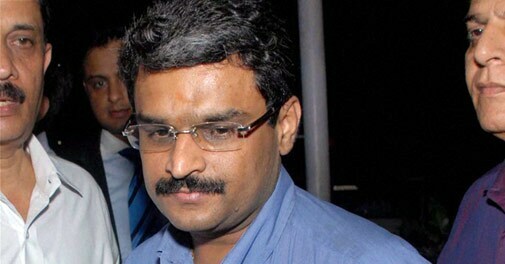 Shah, Founder of Financial Technologies (FT) group, was arrested on May 7 in connection with the Rs 5,600 crore payment scam at group company National Spot Exchange Ltd (NSEL). The Mumbai police's Economic Offences Wing (EOW) also arrested Shreekant Javalgekar, former managing director and CEO of Multi Commodities Exchange (MCX), which is also part of the FT group that provides financial software for trading terminals, along with Shah. Shah and Javalgekar were arrested under the Maharashtra Protection of Interest of Depositors Act and are being held in police custody. According to Rajvardhan Sinha, Additional Commissioner of Police, Shah was arrested as he was not cooperating with police investigations into the fraud and a custodial interrogation was necessary. Sinha said in a press conference that police had evidence regarding Shah's involvement in the NSEL scam. Shah and Javalgekar were first sent to police custody until May 15, which was subsequently extended to May 19. The arrest came as a surprise to many, as Shah was not mentioned in the first charge sheet in the scam filed by the police in January. "Shah's arrest at this stage comes as a surprise," says P.H. Ravikumar, former managing director and CEO of National Commodity and Derivatives Exchange (NCDEX), which competes with MCX. "Unless they [EOW] have fresh evidence against Shah on his involvement [in the scam], they would not have arrested him. There is something more than meets the public eye." According to market grapevine, it was personal vendetta against Shah that landed him in police custody. Talk is that when Shah was fighting to get a licence to start his stock exchange (MCX-SX), he rubbed some people the wrong way. In fact, through his political and bureaucratic connections, Shah complained against a particular finance ministry official. The complaint spoiled the officials career graph and he was transferred from the ministry. However, after P. Chidambaram took over as finance minister the official was recalled to the ministry and tables turned for Shah. Shah's lawyers have told him he may have to stay in police custody for at least a month or two. The arrest may have stemmed public anger but one thing is sure: the money Shah was to shell out of his pocket by selling stakes in group flagship Financial Technologies (India) Ltd, or FTIL, and other entities is not coming. According to a lawyer, who spoke on the condition of anonymity, Shah would have paid out Rs 1,100 crore to Rs 1,200 crore to investors of NSEL after selling stakes in FTIL and MCX. "The situation has taken a turn for the worse following Shah's arrest. Now, FT will not make any voluntary contribution. Investors' hopes of getting 20 per cent back have gone out the window," says the lawyer. While the EOW has said that it did not find any money trail connecting Shah or his family with the entire NSEL fiasco, it has attached Shah's properties including his Juhu bungalow in Mumbai. But it will not be easy for the EOW to sell Shah's properties to recover the money. "It is not possible to get the entire money, butn certainly 80-85 per cent of the money can be recovered in the case of NSEL," says Ravikumar of NCDEX. The spot exchange owes about Rs 5,600 crore to around 13,000 investors. What next for FT Group? The other big question is regarding the future of FT and MCX, the biggest revenue pie of Shah's empire. 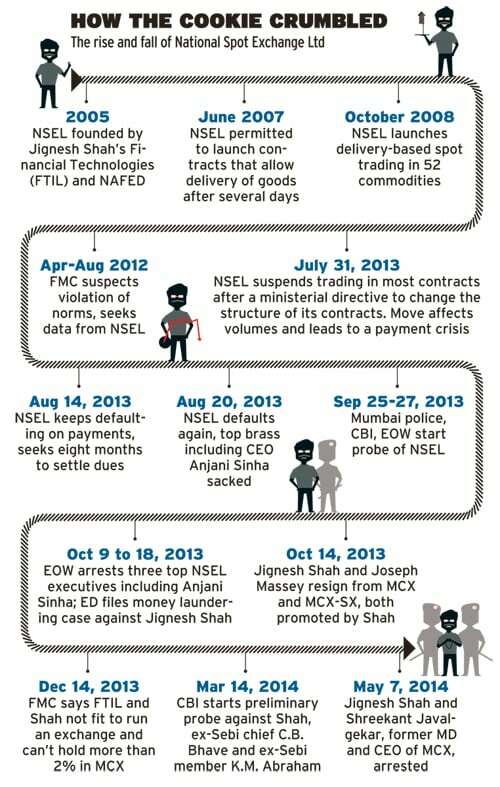 After the NSEL scam came to light in July last year, Shah resigned from the board of MCX in November. In December, the commodities market regulator the Forward Markets Commission (FMC) declared Shah and FT unfit to run a commodities exchange in the country. JM Financial, a Mumbai-based financial services group, and Anil Singhvi, former CEO and managing director of Ambuja Cements, have now been mandated to find a buyer for FTIL and MCX. A senior lawyer who has been advising Shah said on the condition of anonymity that Shah will have to exit the exchange business. "He wanted to fight against the regulator's decision but he was going to fight a losing battle as no one was going to favour him due to the NSEL fiasco," the lawyer says. Queried for its reaction, JM Financial refused to comment on the matter, while email and text messages sent to Singhvi were not responded to. Shah's arrest at this stage comes as a surprise. Unless they [eow] have fresh evidence against shah on his involvement [in the scam], they would not have arrested him. There is something more than meets the public eye"
Another lawyer, who is close to the FT group, said on the condition of anonymity that private-sector lender Kotak Mahindra Bank is likely to pick up a stake in MCX. "The sale process can still go on despite Shah's arrest. Kotak Mahindra Bank was to pick up a stake at Rs 600 per share in MCX, but with Shah's arrest it will try to squeeze more and pay lower than what was quoted earlier," the lawyer says. He says also that software services company Tech Mahindra was interested in buying out FTIL at Rs 375 per share, although it was still not clear whether Shah was willing to exit FTIL. Shah, according to this lawyer, is more in favour of a strategic partner. However, pressure from private-equity firm Blackstone and brothers Ravi and Bharat Sheth are forcing him to offload a stake in FTIL. Blackstone and the two brothers hold a total of about 15 per cent stake in FTIL, according to Bombay Stock Exchange data. A spokesperson for Kotak Mahindra Bank declined to comment on the story. Shah's lawyers had previously sought to blame former NSEL CEO Anjani Sinha for the payment scam but it appears highly unlikely that Shah, an astute entrepreneur, didn't know what was happening at the company. After all, NSEL contributed about Rs 125 crore, or 56 per cent, of the group's consolidated profit in 2012/13. The more likely explanation is that, even if he was not directly involved in the fraud, Shah chose to look the other way so long as the going was good. NSEL was operating in a grey area, and even today neither the FMC nor the corporate affairs ministry is willing to clarify which of them controls spot exchanges in the country and was thus responsible for the fiasco as the regulator. Shah's lawyers hope he will be out of jail sooner or later. The Bombay High Court has already granted bail to Sinha. But no one can guess when will investors get justice and the guilty will be punished. One thing is clear though, that the NSEL investors will have to wait a long time to get back their money. If at all they get anything.